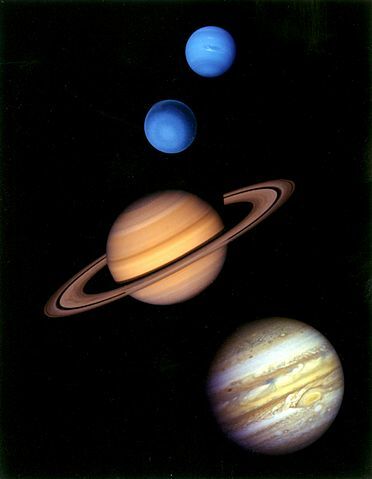 Continuing our quest to understand more about planetary frequencies, we turn to links between the largest planet Jupiter and the two ‘outer’ giant planets, Uranus and Neptune. The period is just under 3771 years (~3770.93y). The 295 J-N is the sum of 22 (U-N) and 273 (J-U), as it must be if the periods match. The 22 U-N is 21 + 1, and 295 J-N is 14 x 21, + 1. Note the decimal places are almost identical. In the chart the decimal places are reduced to three for clarity. So the main point of this post is that the J-U-N synodic frequencies are tied to a multiple of 13 x 21 Jupiter-Uranus conjunctions. Now let’s take a closer look at the orbit numbers. 3, 8 and 55 are Fibonacci numbers. However a closer fit is achieved with 77 as the multiplier. That’s because 68/77 = 0.8831168, almost identical to the decimal place values above. (Incidentally 68 = 34 x 2 which are both Fibonacci numbers). (The synodic numbers were already whole, so just increase by a factor of 77). Now we have Uranus with an exact multiple of Fibonacci numbers: 3,8 and 144. 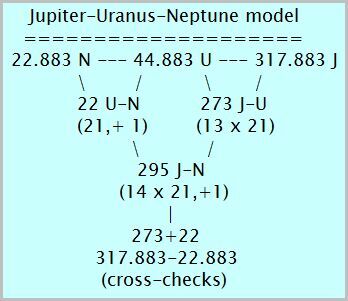 Neptune and Jupiter are very slightly offset from Fibonacci multiples: N by 2, J by 3. N = 55 x 8 x 2 x 2, plus 2. J = 144 x 34 x 5, minus 3. 2,3,5,8,34,55 and 144 are all Fibonacci numbers. Other ‘Why Phi?’ posts are listed here. See also: What is the Golden Ratio?